Today was a lot of fun in Class 4. In the morning we had a great play time and exercise with the senior classes. After our morning meeting all the children did a very good job of helping to find matching uppercase and lowercase letters in the classroom. The children did a very good job of matching all the letters. Today we learned about the Japanese festival of Koinobori. Tomoko sensei taught us a Koinobori song and we made some nice Koinobori freinds for the lonely carp in Class 4. 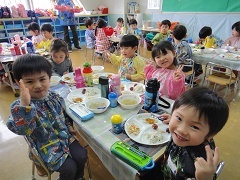 The children really loved today’s lunch and ate a lot of food. 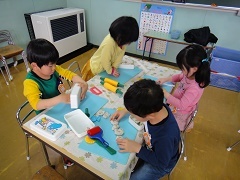 After lunch we learned about numbers and the children had a lot of fun with their clay and sketchbooks. I am sure Class 4 will have even more fun throughout the rest of the week.